GR101 is going to Berlin! 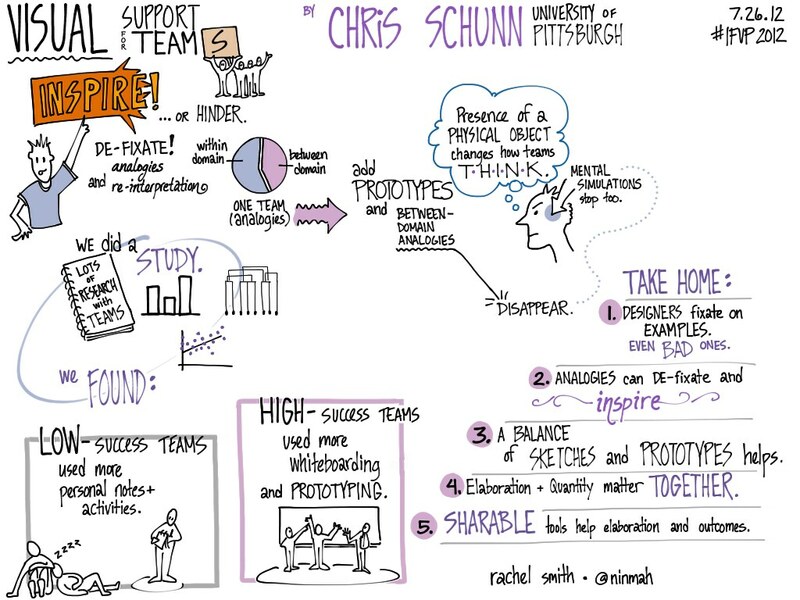 Interested in learning how to be a graphic recorder? Planning to be in Berlin in July? Have I got some news for you! The fabulous Lisa Arora (of Get The Picture) and I will once again be co-leading the IFVP’s signature training, Graphic Recording 101 (or GR101). It will be held on July 22, 2014, in the awesome Hotel nhow. The workshop is scheduled as a pre-conference session in conjunction with EuViz, a brand-new conference hosted by Kommunikationslotsen and Neuland and co-hosted by IFVP. Already, EuViz promises to be something very special. The conference itself is sold out, but the pre-conference isn’t, and you don’t need to attend EuViz to attend GR101. Posted in everything. Tagged with conferences, gr101, graphicrecording, ifvp, visualpractice, workshop. At the 2012 IFVP Conference last week, I took visual notes on my iPad during several sessions. Right after each session — and I mean right after — I posted the image to Flickr and tweeted the link with the conference tag. It took me about 15 seconds to post each one, and I didn’t even have to switch away from my drawing app. Here’s how I did it. 1. Set up Flickr to do the heavy lifting. Once you have a Flickr account, you can set it up so that you can email stuff to it and also so that it will tweet for you. To make the magic happen, log in to your Flickr account and go to Account (You menu > Account, or click on your name in the top right). You have two tasks here: To hook up your Twitter account to your Flickr account, and to get the address you will email stuff to. 2. Create a contact with that email address. Now go to your iPad and open the Contacts app that came with the iPad. Create a new contact (Click the plus sign at the bottom) and call it “Twitter and Flickr” or “Flickr” or something similar. Just make it something you can remember later. Then paste the email address you copied in step 1 into the email field, and save the contact. 3. Find or create a drawing to share. Open your favorite drawing app and either create a new drawing, or find one that you already did that you want to share. I use Brushes and Sketchbook Pro the most, and for both of these, you want to be in the Gallery, not in edit-image mode. When you are looking at the image you want, tap the Share button (in Sketchbook Pro, this looks like a flower with an arrow; in Brushes, it looks like a rectangle with an arrow). You might have to select the image in the gallery in some apps (like SBP) first. If you’re using a different app, look for a similar icon somewhere. Tap this icon. 4. Email the image, including the right text and tags. To: Start to type the name of the “contact” you made earlier (Twitter, Flickr, etc) until that weird email address pops in. Subject: This will become the text of your tweet AND the title of the image on Flickr. If you’re at a gathering, this is the place to include the hashtag (like #IFVP2012) so that it will show up in Twitter searches. It’s also nice to go find the Twitter handle of the speaker and include that, too. That way, the speaker sees your notes later, and sometimes retweets you. Just keep the subject short, because the tweet will also include a shortened URL to your Flickr page. Body: The image is in the body. In addition, any text in the body (including your email signature, so delete that!) will become the photo description in Flickr. I use this space to give more detail about the speaker, the event, or anything special about the notes. When you’re satisfied with the text, hit send! Then go peek at Flickr and Twitter to see what happened. You can adjust your next subject and body based on what you see from this first experiment. That’s it! After you’ve set it up, all you need to do is draw, tap the email button, type in the contact name, add a subject and body, and off it goes! Quick as anything. Posted in everything. Tagged with howto, ifvp, ipad, socialmedia, visualpractice.